I’m not a big fan of accessories that show what your phone does.I’d rather take the smartphone out of my pocket and see what it wants. Then again, Sony’s new SmartWatch, now available in the U.S., does have a certain charm to it and could very well change my opinion. 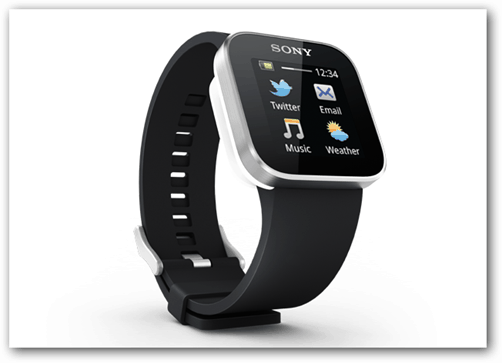 Sony’s watch is designed to be a companion for an Android smartphone, but it doesn’t have to be a Sony model. You need an an app that’s available on the Google Play Store. It does help to own a Sony smartphone, though, as the app is probably pre-installed already. What can it do, you ask? Well, it has a 1.3 inch OLED display at 128 x 128 pixels resolution. It connects to your smartphone via Bluetooth. It will notify you whenever something essential happens on your smartphone, on the display or by vibrating. It comes with mini versions of apps that you can use on it. Apps dealing with call management, messaging, calendar notifications, battery power, Gmail or corporate e-mail (the latter just for Sony Android phones), music player control, weather and a lot more. I bet it can also handle notes, which would make it very useful for cheating on tests (or you could just email yourself the whole book). If you do, don’t tell the teacher where you got the idea. Anyway, the groovy part is that developers can create apps for it. According to Sony’s official press release, the SmartWatch will cost $150 with a black belt and will be available in Sony stores and the Sony website. If you want a different-colored belt – you can choose between pink, white, mint, gray and blue for an additional $20. This is not the first time the company tries its hand at building a smartphone controlling watch. I remember trying out the MBW-100 in 2006 (of course, we were talking Sony Ericsson back then). That one was more on the elegant side, being made in cooperation with Fossil. It was pretty basic – it could show caller ID and display text messages. This one, of course, is more complex and feature rich. without being a phone in itself Still, it looks like a cool gadget for the price, and if it’s useful…even better. doesn’t have a cleanly defined niche. inhabitants of the living world?